WARNING: some kinds of beans (kidney beans especially) have toxins in them that need to be deactivated by boiling first. Do your research before doing this. Gee, Adam. Thirty six hours to cook beans… But I like beans, so it’s tempting enough that I’ll grab a bag of black beans at the grocery store tomorrow to see what I think. The ice cubes are a smart idea. I’d check them after 24 – just squeeze the bag and you can tell if they’re done. Most of the recipes I’ve seen call for them to be cooked at 195F for much less time. I liked the way these came out. A similar experiment didn’t do so well with white beans – they went a kind of sickly brown color, halfway between the raw white bean color and baked beans. Not dark enough to be appetizing. They tasted ok, but looked really nasty. 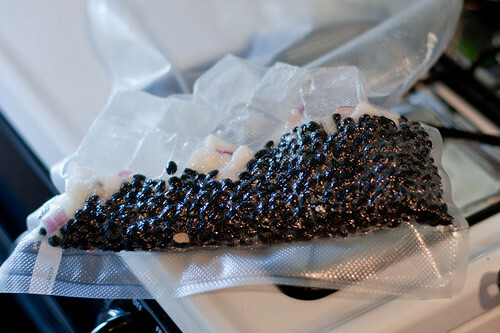 I just dropped a small experimental batch in the SousVide Supreme. 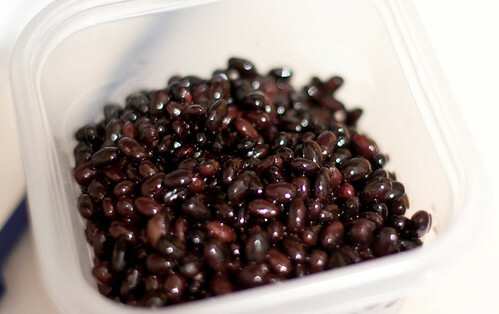 I checked Harold McGee’s “On Food and Cooking” and learned that dried beans absorb their own weight in water, so I rinsed 4 ounces of dried black beans, added 4 ounces of ice cubes and a bit of diced onion to the cooking bag. I wanted a weight measurement, rather than eyeballing equal volumes of beans and ice cubes. If I like the result, I’m going to try a larger batch using chicken stock instead of water. I’ll check for doneness at 24 hours. How did that come out in terms of volume? Precision always helps of course, but I don’t think this needs to be exact as long as you err on the side of more – too little and they’ll be dry, but the only effect of having too much water in there would be some extra liquor at the end.